Pictures Speak Louder Than Numbers : Blog Of The Nation The latest census figures show that Detroit's population has dropped 25 percent over the past ten years. That means one person left the city every 22 minutes for the past decade. The most astounding evidence of the change can be found in photos. 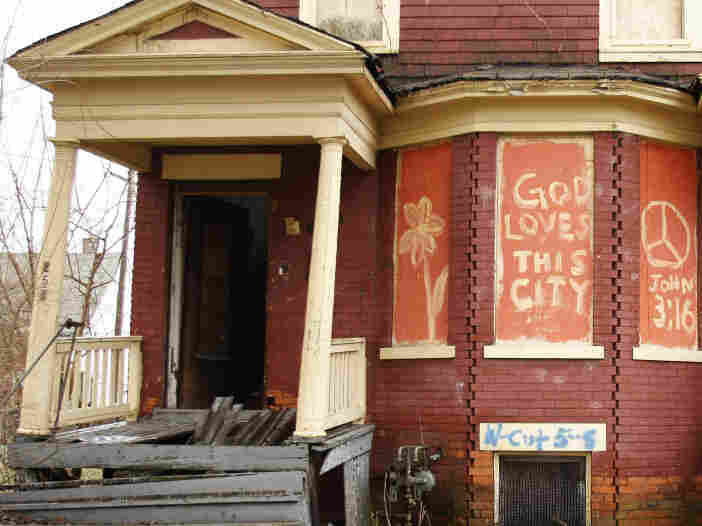 The words, "God Loves This City" are painted on the front of an abandoned home in Detroit. The latest census figures show that Detroit's population has dropped 25 percent over the past ten years. Twenty-five percent sounds like a good chunk. That means 250,000 people emigrated from the city. It sounds even more dramatic when you consider that when you do the math one person left the city every 22 minutes for the past decade. But the most astounding evidence of the change can be found in photos. Last year, two young French photographers, Yves Marchand and Romain Meffre published a book called The Ruins of Detroit. The book features 200 full page photos of the shrinking city-- crumbling houses, empty classrooms, boarded windows, peeling paint and some remarkable before and after photos. Check out some of the most striking photos here. According to the new data, the population is down 60 percent from 1950, when the population peaked at 1.85 million. Dave Bing, the mayor of Detroit said he will challenge the new Census data. "The Census has a history of undercounting residents in urban cities like Detroit," he said. Even if the shift has not been this dramatic, it is clear that a lot has changed in this city. The pictures speak for themselves.